Evian natural mineral water is being presented as the fountain of youth in “Skating Babies”, a follow up to the Babies Underwater Ballet advertising campaign of 1998. Evian-sipping babies, having just learned to walk, chill out on roller blades, outdoing each other with their stunts, chilling out to “Rapper’s Delight” by Dan The Automator. Let’s observe the effect of Evian on your body, or on the bodies of young toddlers with a taste for rap. Two videos, directed in the style of amateur films, showing babies trying to stand up on two feet, are hosted on www.evianliveyoung.com, along with other social video sharing sites. The www.evianliveyoung.com site includes “making-of” videos featuring interviews with three of the film’s babies curled up in armchairs on the set. Tom Morse, Anna Capolavoro and Vincent Huyng each have a Facebook profile. 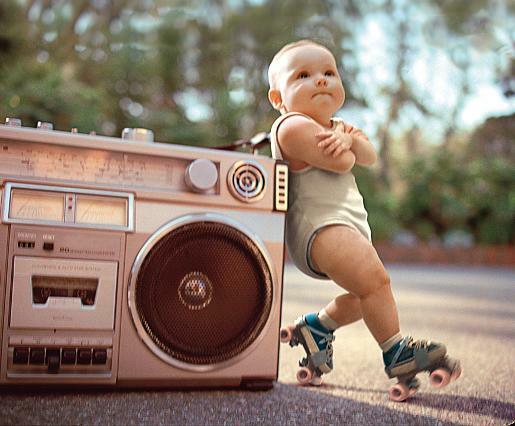 The Skating Babies campaign was developed at BETC Euro RSCG, Paris, by global creative director Rémi Babinet, art director Agnès Cavard, assistant art direector Gregory Ferembach, copywriter Valérie Chidlovsky, music supervisor Christophe Caurret. The Web component was developed at BETC 4D by agency account managers Olivier Vigneaux and David Roux, creative director Vincent Vella, art director David Tamayo, copywriter Pierre Duquesnoy, community manager Alexis Thobellem. Filming was shot in Melbourne by director Michael Gracey via Partizan with directors of photography Alex Barber and Greg Fraser, executive producer Jaques Etienne Stein, and producer Fabrice Brovelli. A total of 134 babies were filmed at Pinewood Studios, UK to provide the post production team material to integrate with computer generated babies. A professional skater was filmed performing a range of moves, once again to be replicated by the post production team. Visual effects were developed at The Moving Picture Company, London. MPC created fully CG baby bodies and carried out extensive live action head replacement and compositing as well as large scale digital matte paintings to extend the park environment for the TV and online campaigns. The MPC team members were executive post producer Vittorio Giannini, post supervisor Rahel Makonnen, post producer Paul Branch, VFX supervisors Dean Robinson and Ludo Fealy, 3D VFX Team James Bailey, Anthony Bloor, Ross Denner, Ali Dixon, Daniel Elliott, Ahmed Gharraph, Andreas Graichen, Lewis Guarniere, Mark Harrison, Robert Hesketh, Jake Mengers, Alexandre Millet, Jorge Montiel, Jordi Onate, Vicky Osborn, Emanuele Pavarotti, Simon Payne, Dean Robinson, Wayne Simmons, Charlotte Tyson, Grant Walker, 2D VFX team Dan Adams, Chrys Aldred, Mark Beardall, Mike Brazelton, Kelly Bruce, Stuart Bullen, Hayley Collins, Miodrag Colombo, Ludo Fealy, Olivier Jezequel, Vaibhav Marathe, Alasdair McNeill, Mikael Pettersson, Yourick Van Impe, colorists Paul Harrison and Jean-Clement Soret. Editor was Ben Harrex at Final Cut.